MISSOURI: Republican Sen-Elect Josh Hawley Under Investigation For Using Public Employees In Campaign - Joe.My.God. Missouri Secretary of State Jay Ashcroft has launched an investigation into a complaint that Missouri Attorney General Josh Hawley used public resources in his successful bid for the U.S. Senate. The American Democracy Legal Fund on Nov. 2 filed a complaint with Ashcroft, claiming that Hawley used out-of-state political consultants to direct the activities of public employees in the attorney general’s office to raise Hawley’s political profile as he prepared to mount a campaign for U.S. Senate. 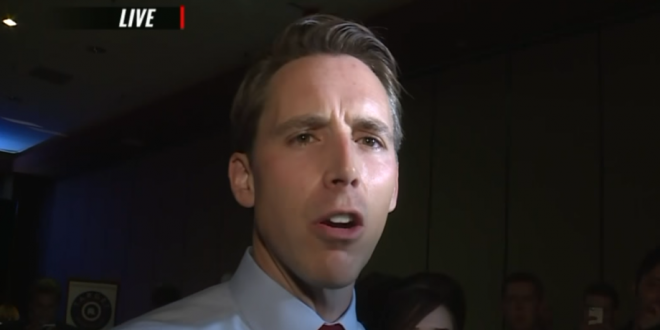 “Josh Hawley’s flagrant abuse of his taxpayer funded office for his own political gain deserves immediate investigation,” said Brad Woodhouse, ADLF president, in a statement. “We’re heartened to see Secretary of State Ashcroft give this racket further scrutiny. U.S. Sen. Claire McCaskill, D-Mo., argued in the campaign’s closing days that Hawley may have committed a crime by inviting political advisers to manage aspects of his office. Hawley first appeared on JMG in 2015 when as a candidate for Missouri attorney general he backed a proposal to legalize anti-LGBT business discrimination in the name of Jesus.